Today I want to welcome a wonderful friend that I finally had the pleasure to meet in person back in October at The Southern Food Bloggers Retreat. Please welcome Steph to the blog and if you are not following Plain Chicken, you are missing out! Please make sure you show her some love. This recipe looks and sounds fantastic! Hello everybody! I am Stephanie, and I blog over at PlainChicken.com I make quick and easy recipes with everyday ingredients that are guaranteed to please the pickiest eaters. Don't worry, it is much more than chicken! I make a little bit of everything. I want to thank Melissa for letting me guest post today! I have a great (and easy) dessert to share with you. Let's get to it! I've been making a version of this Graham Cracker Brittle for many years. It is so good and super easy. It only takes about 5 minutes of hands-on time and about 15 minutes total. I thought I would change it up a bit this year and add some chocolate. O-M-G! Amazing! The chocolate really puts this toffee over the top. This makes a ton, so there is plenty to share. I gave this as neighbor gifts and it was a huge hit. They all wanted the recipe. 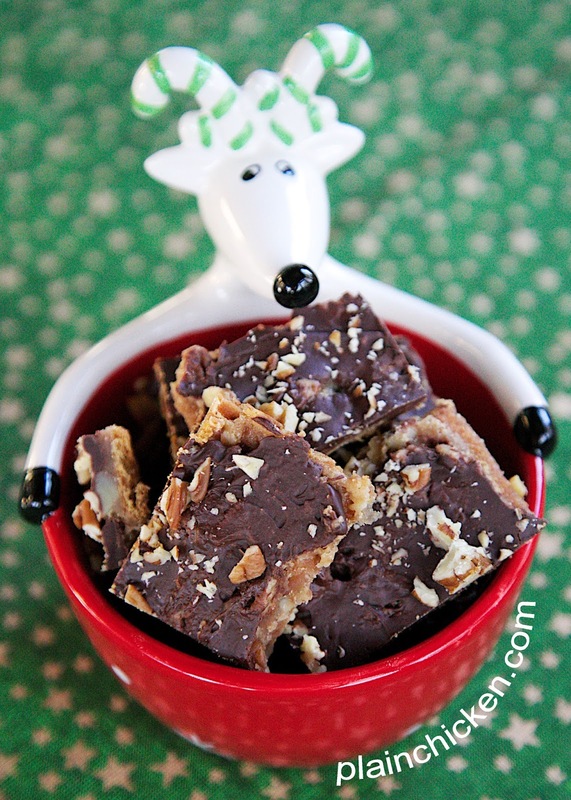 This would be a great addition to your holiday cookie tray! Preheat oven to 350 degrees. Line a 15x10 pan with foil. Place a single layer of graham crackers on pan. You may have to break up the graham crackers to cover the whole pan. In a medium sauce pan, melt butter and brown sugar. Bring to a boil. Boil for 3 minutes. Remove from heat. Stir in vanilla and 1 cup of chopped pecans. Pour pecan mixture over graham crackers. Spread evenly over crackers. Bake for 7 minutes. Remove from oven and top with chocolate chips. Bake for an additional 3 minutes. Remove from oven and spread melted chocolate chips over brittle. Top with remaining 1/2 cup of chopped pecans. Allow to cool and break into pieces. Thank you Steph for being so great to step in and help me out at the last minute. I know the holidays are extremely crazy for all of us and it means the world that you took time out of your day for me. I love you to pieces! Thank you for letting me guest post! 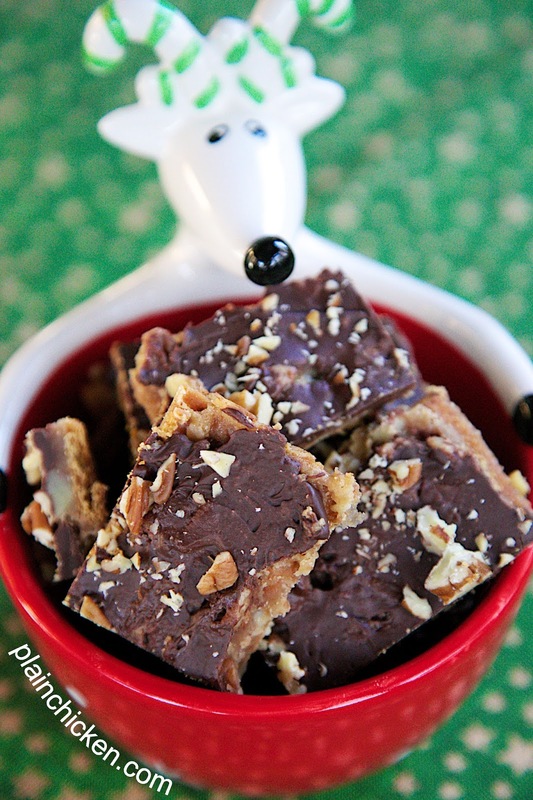 I need to make another batch of this Chocolate Graham Cracker Brittle. I gave away (and ate) all of this batch! Thank you Stephanie for guest posting! I love this recipe and cant wait to make it. I forgot the graham crackers at the store yesterday but plan to get this weekend. My family will love this!